NON-STARTER . . . . Portadown were forced to pull Keith O'Hara'''from their starting line-up tonight. Portadown manager Pat McGibbon had to pull captain, Keith O’Hara from his starting line-up just hours before kick-off tonight against Ballinamallard United. Club sources have confirmed the decision was made to protect Portadown from any potential disciplinary problems following a lack of confirmation from the Irish Football Association over the registration status of O’Hara and the injured Ken Oman. A decision in April by the IFA disciplinary committee left Portadown unable to sign players on professional terms until June 2017. 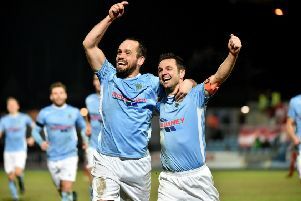 Ports officials are adamant that clarification was given at the time by the IFA over the process relating to existing players coming out of pro contracts and looking to re-sign. Oman and O’Hara remain the only players under fresh pro terms and contracts were delivered to the IFA yesterday (Tuesday) ahead of the 12 o’clock registration deadline for play tonight (Wednesday) against Ballinamallard. However, Portadown were subsequently sent a list of registered players just before 5 o’clock this evening - with Oman and O’Hara absent from the official document. We have found it difficult to get word from anyone and have been told that at least four people connected to the IFA are aware of our situation but no-one seems willing to make a decision before kick-off. Repeated attempts by club officials to clear up the issue with the IFA failed to result in any progress, with McGibbon opting to proceed with caution and withdraw O’Hara from his line-up. It is understood that high-ranking Northern Ireland Football League officials even offered to assist Portadown in attempting to get answers from the IFA ahead of kick-off but all steps ended in disappointment. “We have found it difficult to get word from anyone and have been told that at least four people connected to the IFA are aware of our situation but no-one seems willing to make a decision before kick-off,” said a Portadown source. “As a result, we felt it was best to pull Keith out of the side despite the late hour and disruption to our match plans. “At the time of the punishment, we checked and double-checked how it would impact on players at the club looking to sign again on pro terms. “We were told it was allowed so, from our viewpoint, we have moved forward on the basis of that information. “We sent the contracts for Keith and Ken to the IFA this week but then got the e-mail of the list back to find both names missing. “It seems no-one from the IFA is willing to confirm at this point if Keith and Ken have signed as “existing” players or “new” players. Tonight’s game marks the first of the Danske Bank Premiership season for Portadown following the postponement of the scheduled trip to Coleraine last weekend because of a pending appeal over an IFA “suspension of football activities”.